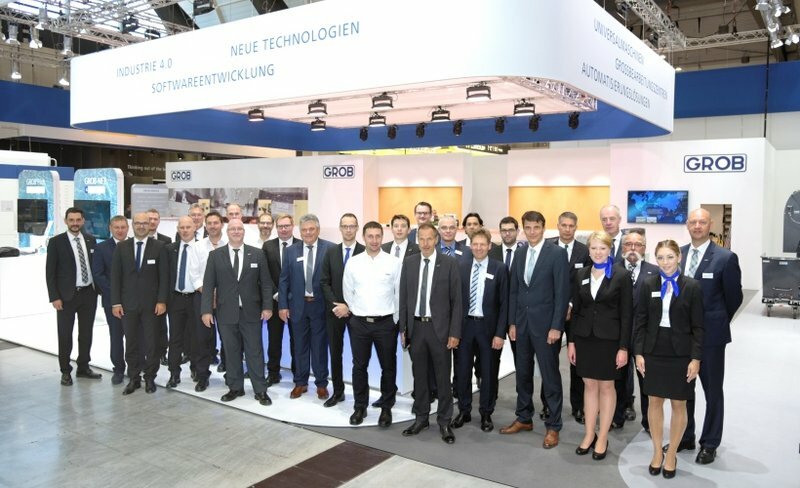 The AMB 2018 was the most successful AMB for the GROB Group since its first participation ten years ago. We spoke to Peter Hermanns, GROB Sales Manager for Universal Machining Centers Europe, at the end of the event. Mr. Hermanns, how was the 2018 AMB for GROB in your opinion? Peter Hermanns: Taking all parameters into account, we are pleased to look back on a very successful trade fair. Overall, we saw a 20 percent increase in visitor numbers. Despite our stand area being almost twice the size as the one we had at the 2016 AMB, the meeting rooms and seating areas were full to capacity. The new position of our stand in Hall 10 also brought us a much higher footfall. As a result, we were able to acquire more new customers and establish more contacts, which is, alongside customer care, an important argument for our trade fair activities. What is your overall impression of the AMB? This trade fair was generally very good. We saw an excellent turnout on all the days, without exception. We were able to see how the AMB continues to gain significance and is now, without doubt, one of the two leading mechanical engineering fairs in Germany after the EMO. Starting out as rather a regional trade fair, the AMB has gradually established itself at European level. This is because on the one hand, it is held in the heart of Germany's automotive industry, and on the other enjoys ideal transport links to Stuttgart airport. Does this mean that in future, GROB's only trade fairs in Germany will be the EMO in Hanover and the AMB in Stuttgart? The international EMO trade fair in North Germany and the AMB in South Germany are certainly set to stay high on the agenda. For GROB, however, smaller-scale fairs such as Moulding Expo, continue to be important for acquiring new customers. So we will still exhibit at regional trade fairs on a regular basis. So how does the in-house exhibition feature in the GROB trade fair calendar? So far, we have held our in-house exhibition at the main plant in Mindelheim every two years after the EMO. The aim is to bring our existing customers and the customers we acquire at the EMO together in Mindelheim to be able to demonstrate large systems and, just as importantly, show them our company. This means that our in-house exhibition is an important and permanent addition to the GROB trade fair calendar. The 2018 AMB was the biggest AMB of all time. An exhibition area of over 120,000 m² in ten halls, 1,553 exhibitors and 91,016 visitors made Stuttgart the focal point of the metalworking sector for an entire week. Innovations and further machine tool developments relating to traditional and nontraditional machining were among the exhibits.